Hey look- it's a post! It's just hard to spend that many more hours at the computer. I guess you could say I'm suffering from a motivation problem. Even worse, most of my winter recipes are now out-of-season; I was just bemoaning the end of Kale. Which at least half my winter recipes have used, dammit. We usually fancy it up for Christmas, but this (technically last) year I didn't have a damn thing planned for our usual romantic feast. Lucky for me, there's almost nothing seasonal in the recipe, so I can post it 2+ months after the fact, and not feel like anyone reading this would need to wait a year to try out the recipe. 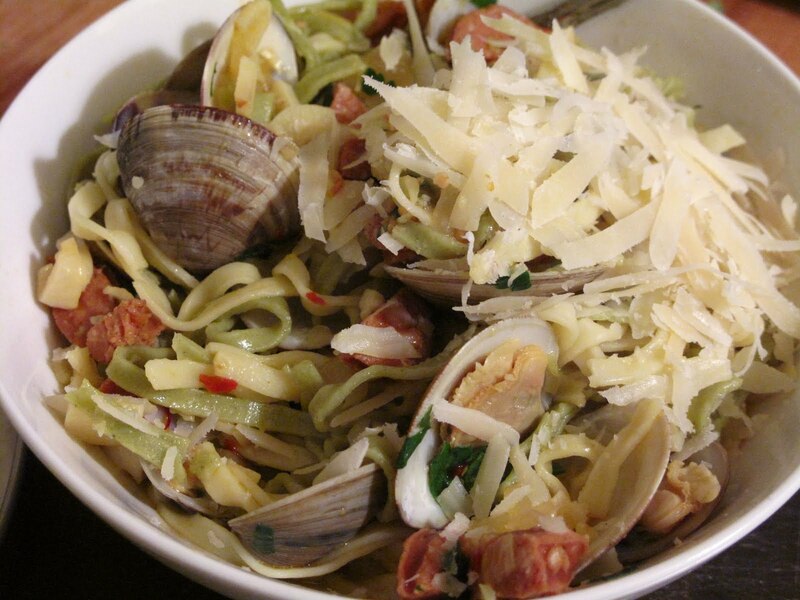 Really I was just craving clams again (which always seem like a "fancy" special food to me) when I saw chorizo at the store and thought "mmm spicy" and was inspired. I googled around for some recipes using both and found the two below. I had a suspicion it'd be a bit too much flavor, but turned out fantastic! Though it's not a meal worthy of the tittle "feast" the idea seemed like it needed sharing, so we invited a friend over for some pre-Christmas wine & wii; a good time was had by all.